"Balance of powers" redirects here. For other uses, see Balance of power. For other uses, see Separation of powers (disambiguation). 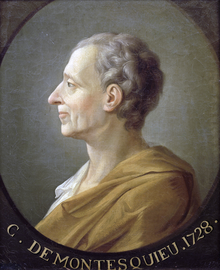 The term "tripartite system" is commonly ascribed to French Enlightenment political philosopher Baron de Montesquieu, although he did not use such a term. In reality he referred to "distribution" of powers. In The Spirit of the Laws (1748), Montesquieu described the various forms of distribution of political power among a legislature, an executive, and a judiciary. Montesquieu's approach was to present and defend a form of government which was not excessively centralized in all its powers to a single monarch or similar ruler, form of government known then as "aristocracy". He based this model on the Constitution of the Roman Republic and the British constitutional system. Montesquieu took the view that the Roman Republic had powers separated so that no one could usurp complete power. In the British constitutional system, Montesquieu discerned a separation of powers among the monarch, Parliament, and the courts of law. Checks and Balances are designed to maintain the system of separation of powers keeping each branch in its place. This is based on the idea that it is not enough to separate the powers and guarantee their independence but to give the various branches the constitutional means to defend their own legitimate powers from the encroachments of the other branches. They guarantee that the powers of the state have the same weight (co-equal), that is, to be balanced, so that they can limit each other, avoiding the abuse of state power. The origin of checks and balances, like separation of powers itself, is specifically credited to Montesquieu in the Enlightenment (in The Spirit of the Laws, 1748), under this influence was implemented in 1787 in the Constitution of the United States. Constitutions with a high degree of separation of powers are found worldwide. The UK system is distinguished by a particular entwining of powers. A number of Latin American countries have electoral branches of government. Complete separation of powers systems are almost always presidential, although theoretically this need not be the case. There are a few historical exceptions, such as the Directoire system of revolutionary France. Switzerland offers an example of non-Presidential separation of powers today: It is run by a seven-member executive branch, the Federal Council. However, some might argue[ weasel words] that Switzerland does not have a strong separation of powers system, as the Federal Council is appointed by parliament (but not dependent on parliament) and although the judiciary has no power of review, the judiciary is still separate from the other branches. Australia does not maintain a strict separation between the legislative and executive branches of government—indeed, government ministers are required to be members of parliament—but the federal judiciary strictly guards its independence from the other two branches. However, under influence from the US constitution, the Australian constitution does define the three branches of government separately, and this has been interpreted by the judiciary to induce an implicit separation of powers. State governments have a similar level of separation of power, but this is generally on the basis of convention, rather than constitution. The Constitution of the Czech Republic, adopted in 1992 immediately before the dissolution of Czechoslovakia, establishes the traditional tripartite division of powers  and continues the tradition of its predecessor constitutions. The Czechoslovak Constitution of 1920, which replaced the provisional constitution adopted by the newly independent state in 1918, was modeled after the constitutions of established democracies such as those of the United Kingdom, United States and France, and maintained this division,  as have subsequent changes to the constitution that followed in 1948 with the Ninth-of-May Constitution, the 1960 Constitution of Czechoslovakia as well as the Constitutional Act on the Czechoslovak Federation of 1968. Legislature. A bicameral legislature that includes the Senate (upper house) and the National Assembly (lower house). The relationship between the two houses is asymmetric, meaning that in case of dispute, the National Assembly has the final word according to Article 45  of the Constitution. The courts frequently exercise a power of judicial review of administrative actions and also decide matters of constitutionality of legislation, though this power is circumscribed under the power of the People's Republic of China's National People's Congress to make final determinations as to interpretation. Hence, the separation of powers is again structurally weak. Like every parliamentary form of government, there is no real separation between Legislature and Executive, rather a continuum between them due to the confidence link. By the way, the balance is protected by Constitution also between these two branches. and, obviously, between them and the judiciary branch, which is really independent. Police or regulators cannot initiate complaints under criminal law but can only investigate (prosecution is mostly reserved for the Crown Prosecution Service), which prevents selective enforcement—e.g., the " fishing expedition" which is often specifically forbidden. The federal government refers to the branches as "branches of government", while some systems use "government" to describe the executive. 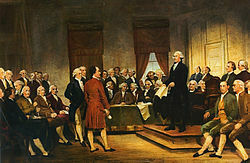 The Executive branch has attempted  to claim power arguing for separation of powers to include being the Commander in Chief of a standing army since the American Civil War, executive orders, emergency powers and security classifications since World War II, national security, signing statements, and the scope of the unitary executive. The relationship between the executive and legislative branches are poorly defined. An example of the problems this causes is the near complete political paralysis that results when the president, who has neither the power to veto nor the ability to dissolve the legislature and call new elections, cannot negotiate with the legislature when his party is in the minority. The examination and control yuans are marginal branches; their leaders as well as the leaders of the executive and judicial yuans are appointed by the president and confirmed by the legislative yuan. The legislature is the only branch that chooses its own leadership. The vice president has practically no responsibilities. The European Union is a supranational polity, and is neither a country nor a federation; but as the EU wields political power it complies with the principle of separation of powers. There are seven institutions of the European Union. In intergovernmental matters, most power is concentrated in the Council of the European Union—giving it the characteristics of a normal international organization. Here, all power at the EU level is in one branch. In the latter there are four main actors. The European Commission acts as an independent executive which is appointed by the Council in conjunction with the European Parliament; but the Commission also has a legislative role as the sole initiator of EU legislation. An early maxim was: "The Commission proposes and the Council disposes"; and although the EU's lawmaking procedure is now much more complicated, this simple maxim still holds some truth. As well as both executive and legislative functions, the Commission arguably exercises a third, quasi-judicial, function under Articles 101 & 102 TFEU (competition law ); although the ECJ remains the final arbiter. The European Parliament is one half of the legislative branch and is directly elected. The Council itself acts both as the second half of the legislative branch and also holds some executive functions (some of which are exercised by the related European Council in practice). The European Court of Justice acts as the independent judicial branch, interpreting EU law and treaties. The remaining institution, the European Court of Auditors, is an independent audit authority (due to the sensitive nature of fraud in the EU). Besides the constitutional court the judicial branch at the federal level is made up of five supreme courts—one for civil and criminal cases (Bundesgerichtshof), and one each for administrative, tax, labour, and social security issues. There are also state ( Länder / Bundesländer) based courts beneath them, and a rarely used senate of the supreme courts. The Empire of Brazil (1822–1889) had, in addition to the three traditional powers, the moderating power, which was exercised solely by the Emperor,  and which function was resolving conflicts between the other powers.